Most cause maps deal with some problem. This cause map is different in that the primary effect on the left is to be desired rather than avoided. 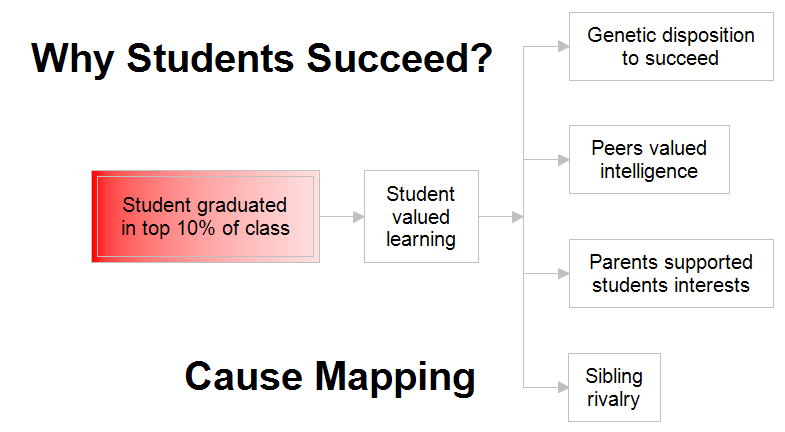 In the above cause map, the student graduated in the top 10% of his class and we are asking why this happened. The primary effect is shown on the left in red. Color is not necessary in cause mapping, but it is helpful to highlight the main effect. You read this chart from left to right and add the words "was caused by" at each line. For example, "Student valued learning" was caused by "Genetic disposition to succeed" and/or "Peers valued intelligence" and/or "Parents supported students interests" and/or "Sibling rivalry." Once RFFlow is installed, you can open the above chart in RFFlow by clicking on cause-map-student.flo. From there you can change the text to reflect your problem. It is often easier to modify an existing chart than to draw it from scratch.